Tristram Hunt was today dragged into the dispute over Andrew Marr’s BBC TV series The Making of Modern Britain, discussing the issue of history on television with Marr’s vociferous critic Charles Moore on Radio 4’s Today programme. 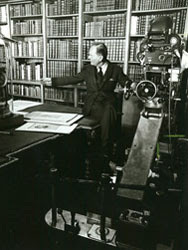 The package began with three excerpts: from Kenneth Clark’s 1969 TV series Civilisation (all clipped tones and cultural certainties); Laurence Olivier, raising the art of narration to its zenith in Thames TV’s The World at War; then Andrew Marr talking about posh, possibly very cruel, people in hats. Moore gave the impression of a man who simply doesn’t like television, regarding it as an intrusion (sometimes I know how he feels) into his Trollopian, High Tory world. Tristram Hunt is a fan of TV: since the debacle of his series on the Civil War (which Moore, then the Daily Telegraph’s editor, urged the BBC to pull halfway through its run), Hunt has proved himself to be an inspired public historian (if you want proof, read his excellent column in this week’s Guardian). But I have to disagree with him on one thing. He talked of his recent experience watching Andrew Marr’s series with a class of 14-year-olds in Walthamstow, north-east London. Despite its silly stunts and simplicities, they find it boring. I suspect that some children find everything boring. From this single experience, Hunt concluded that to grab the attention of ‘inner city’ youngsters one would be inclined to make ever more whizz-bang TV, with fast edits, crude simplicities and trite modern-day parallels. At least that is what Hunt’s logic dictates. But I simply don’t believe that to be the case. Inner city youngsters are just as capable of understanding proper history as anyone else, but it is quite unlikely that they have ever been exposed to it, certainly not on television in the way that an ‘inner city’ youngster of my generation was. As I remember (and I watched every episode when it was originally shown, with great anticipation) The World at War was shown prime time on ITV. It was superbly written by proper historians, brilliantly narrated (by Olivier) and edited, by Jeremy Isaacs. Civilisation, similarly, and such programmes – and there were many others – appeared on BBC1, mingled with light entertainment, sport and news. That is no longer the case. Diarmaid MacCulloch’s History of Christianity is tucked away on the cultural ghetto of BBC4 (and will probably eventually appear, late night, on BBC2). A bright, curious working-class teenager is unlikely to come across it by happenstance after an episode of Eastenders (though it is considerably more uplifting). OK, one might say, what kind of teenager will be interested in MacCulloch’s programme other than those families who have BBC4 and Radio 4 as default channels. Fair enough. But the BBC has just thrown away a remarkable opportunity to attract a great number of youngsters to engage in serious history. Its series, A History of the World in 100 Objects launches early next year. It’s a brilliant premise: each programme takes as its subject an object from the BM’s vast collection – a flint hammer from stone age Africa; an Aztec serpent; the statue of an Indian god or the Roman Emperor Hadrian; a relic from the Industrial Revolution – and its fascinating story is told. What a visual treat, what wonderful stories, perfect for all the family, they will follow or precede Eastenders on a daily basis. Or rather they won’t. The stories of these visually remarkable objects will be told on – Radio 4. These stories, it seems, are too good for the proles who also pay the licence fee. Which suggests that the BBC no longer speaks or even seeks to speak to one nation, but two. There is BBC4, Radio 4 and (the utterly superb) Radio 3 for the educated and aspirational. And there is BBC1 and, increasingly, BBC2 for the rest. Or shall we call it ‘BBC2, D’. It is a shocking betrayal of the BBC’s historical role to inform, educate and entertain, and they will pay a heavy price in the long run. I too was sorry that the BM's history in 100 objects was to be on radio, not TV.